Meanwhile, mix the sifted bread flour with the cinnamon, vanilla extract, and salt in the bowl of a stand mixer. Pour in the yeast mixture; then add the whole egg and egg yolk. Mix on medium speed until it is fully combined. The dough will be yellow and stiff, yielding only slightly to a poke. Cover the mixing bowl with plastic wrap and let the dough rest in a warm place for about thirty minutes. Kneading very gently, incorporate the sugar crystals just enough to get them evenly distributed. Work quickly so as not to soften the buttery dough too much. Divide the dough into a dozen equal pieces, gently forming them into balls. Place the balls of dough on a cutting board in a warmish place for fifteen minutes or so. During the last two minutes of this resting time, preheat your waffle iron until it is very warm, but not hot. Spray the griddles with cooking oil. 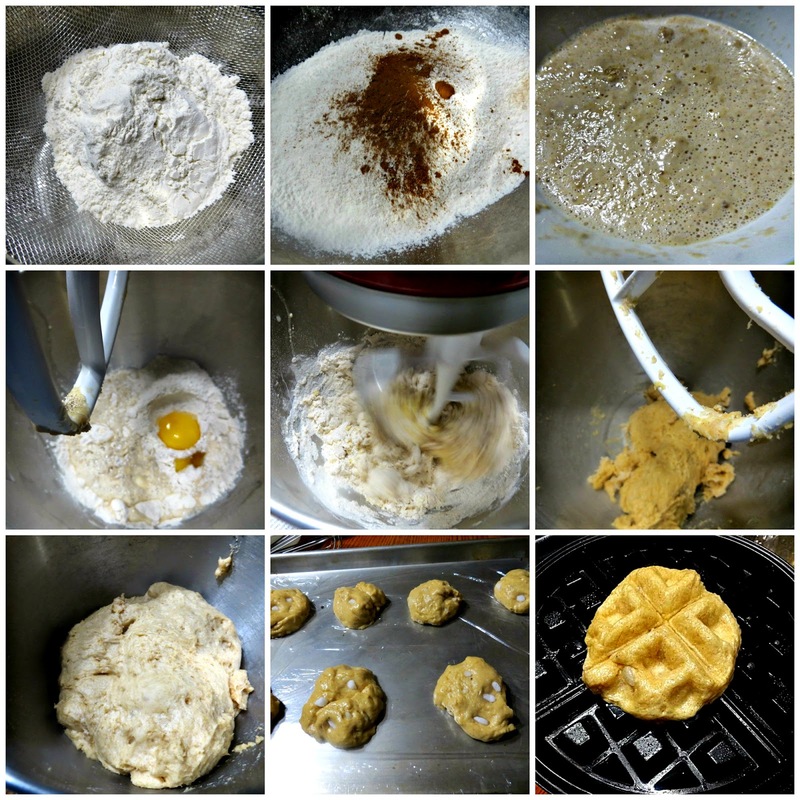 Place each ball of dough in a whole square or section of the waffle iron. Like regular waffle batter, the dough will start to puff up. Cook the waffles until the surface is golden to dark brown. Be sure that the waffle iron you are using is appropriately deep, or else the interior of the waffle will not be cooked through. If you are using a vintage stove top waffle iron, flip the iron every thirty to forty seconds, lifting the iron to check the rate of browning. The browning should be gradual to allow the interior to fully develop. 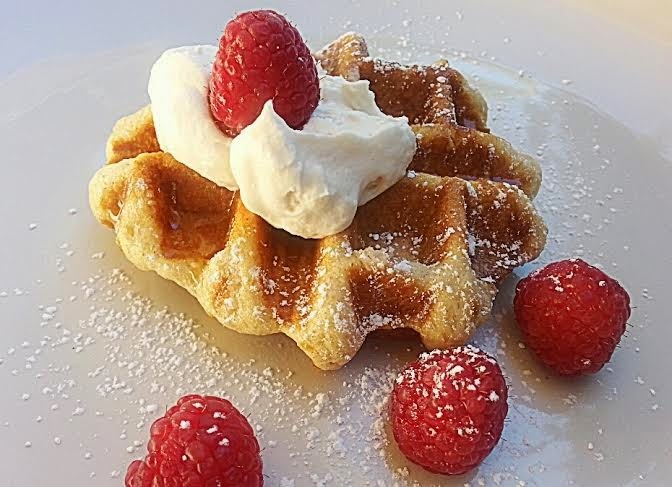 Set the waffles on a cooling rack as they come out of the iron to promote a crispy exterior. Serve immediately with a sprinkling of powdered sugar. 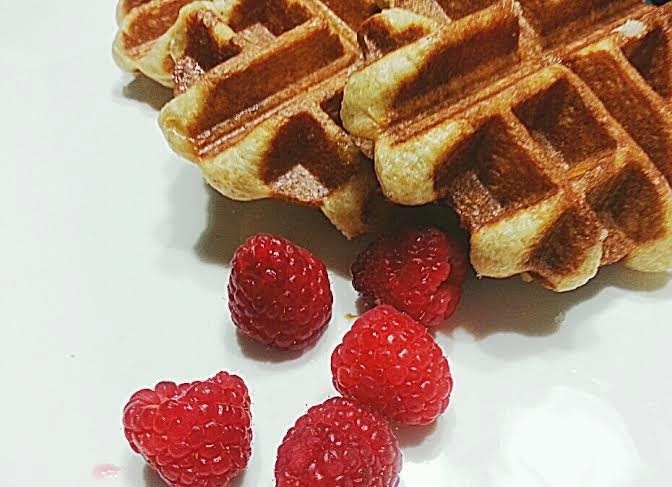 The dough is definitely different but the waffle deserves credit for its texture- crunchy exterior and soft, buttery interior; the sweetness coming but from the pearl sugar. 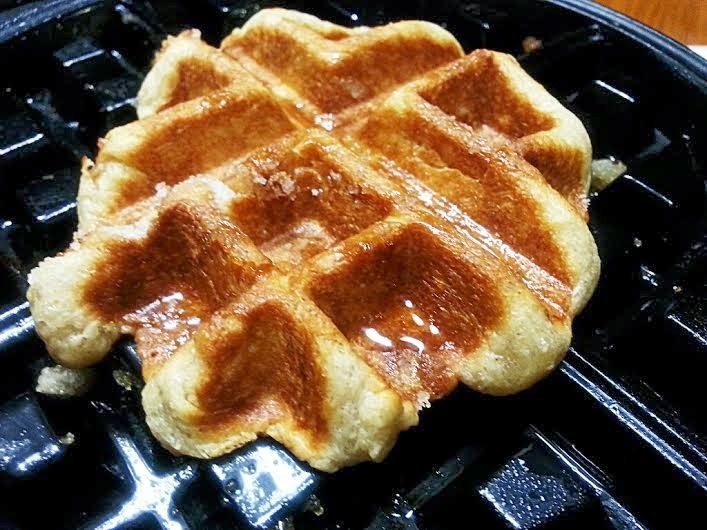 I just love it melted as it gives the waffle that beautiful sheen and while the pearls are supposed to be melted, I love it as well when almost melted and crunchy and brittle to the bite. 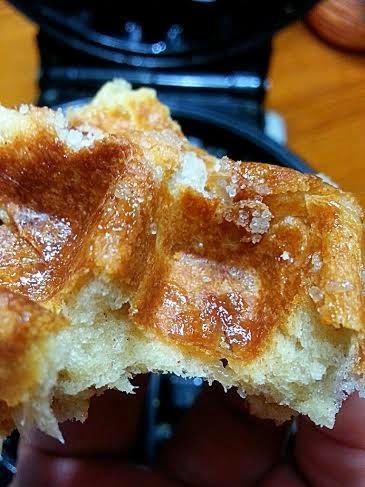 The verdict- the overnight dough still yields the better waffle IMHO but this is a wonderful alternative and worthy of my respect.